'Design Thinking' may seem tautological (after all, what design process doesn't involve thinking? ), but this is a relatively new user-centred approach to design, which marries many of the tried and tested methods previously employed with a strong focus on empathising with the intended users. In The Sciences of the Artificial, Herbert Simon (1969) outlined one of the first formal models of the Design Thinking process. Simon's model consists of seven major stages, each with component stages and activities, which are as follows: Understanding, Observation, Defining (the problem), Ideation, Prototyping, and Testing. As these stages are not always sequential, often occurring in parallel and repeated over the course of an iterative process, they are best thought of as modes (Waloszek, 2012). 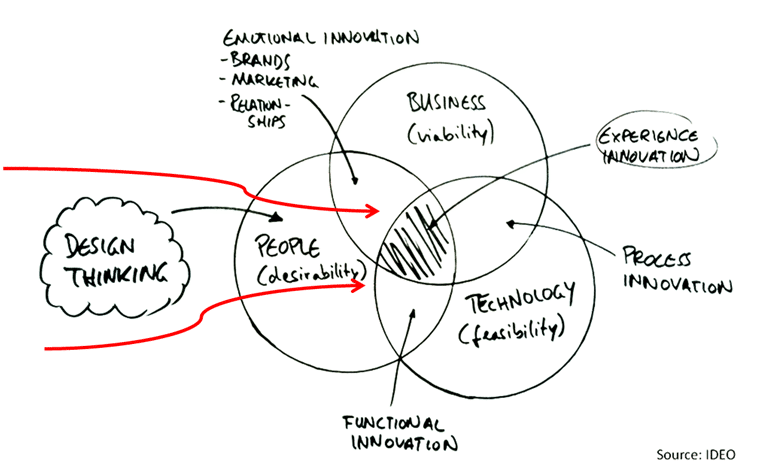 Simon's model is seen by many as the most typical of the Design Thinking models; with the various stages represented in most Design Thinking projects. Design process models identify the stages involved and help describe and define the activities you would expect to be carried at each of these stages. Every project will involve activities specific to the product under development, but the central idea behind each stage remains, largely, the same. Below you will find a description of each stage as outlined by Simon (1996). The first stage of the Design Thinking process involves some form of information gathering and visualisation. Designers will attempt to develop as deep understanding of the problems they are trying to solve and to empathise with the eventual users, customers, and/or consumers. The d. School Bootcamp Bootleg (HPI), which views the component stages as 'modes', suggests that this stage is for empathising and engaging, as well as immersing oneself in the project to assume the role of the intended users and gain any possible insights into their behaviour, attitudes, thoughts etc. In the second stage or mode, designers, possibly joined by some of the project stakeholders, investigate further by observing real users, employees, customers, and anyone who will either be using the product at the end or that might provide inspiration in the design process. Various methods of observation are used, but generally the design team will passively observe users/customers/etc passively (i.e. without physical involvement or interaction) in a natural environment. Depending on time constraints, a substantial amount of information is gathered at the stage to inform the next stage and to develop the best possible understanding of the problems that underlie the development of that particular product. At this stage the information gathered from the first two stages is collected together, analysed and used to help the team define the problems they have identified up to this point. The results are interpreted in terms of the product under development, to help the designers establish features, functions, and any other elements that will allow them to solve the problems or, at the very least, allow users to rectify issues themselves with the minimum of difficulty. At this stage, designers generate ideas. They are encouraged to 'think outside the box' to identify new solutions, and alternative ways of viewing the problem. Brainstorming sessions are typically used to stimulate free thinking and to expand the problem space (Waloszek,2012). A variety of other methods are also used, but the central drive is to get as many ideas or problem solutions as possible, so that they can then investigate and test them to find the best way to either solve a problem or provide the elements required to circumvent the problem. The design team will now produce a number of inexpensive, scaled down versions of the product or specific features found within the product, so they can investigate the problem solutions generated in the previous stage. Prototypes might be shared and tested within the team itself, in other departments or on a small group of people outside the design team. This is an experimental phase, where the aim is to identify the best possible solution for each of the problems identified in the first three phases. The solutions are implemented within the prototypes and one-by-one they are investigated and either accepted or rejected on the basis of the user's experiences. By the end of this stage, the design team will have a better idea of the constraints inherent within the product, the problems that are present, and have a better/more informed perspective of how real users would behave, think, and feel when interacting with the end product. Designers or evaluators rigorously test the complete product, with the best solutions identified during the prototyping phase. This is the last stage of the model, but in an iterative process the results collected from the testing phase are used to redefine one or more problems and inform the understanding of the users, the conditions of use, how people think, behave, and feel, and to empathise. Even within this phase, alterations and refinements are made to falsify problem solutions and derive as deep understanding of the product and its users as possible. We may have outlined a direct and linear Design Thinking process, with one stage seemingly leading to the next with a logical conclusion at user testing, but in practice the process is carried out in a more flexible and non-linear fashion. More than one stage might be carried out at the same time by different groups within the design team or the designers might collect information and prototype all the way through the project to help them bring their ideas to life and visualise the problem solutions. Design Thinking should not be seen as a concrete and inflexible approach to design; the component stages identified in the image above serve as a guide of the activities you would typically find, but to gain the purest and most informative insights for your particular project, these stages might be switched, conducted concurrently and repeated a number of times in order to expand the solution space then narrow down on the best possible solutions. These are just some of the twists and turns that take place in Design Thinking projects, and as you can see from the image above, one of the main benefits of the seven-stage model can be seen in the way knowledge acquired at the later stages can feedback to earlier stages. Information is continually used to both inform the understanding of the problem and solution spaces, and to redefine the problem(s). This creates a perpetual loop, where the designers are continually gaining insights, developing new ways of viewing the product and its possible uses, and feeling a greater sense of understanding for the users and the problems they face. The modes are linked in other ways to those seen in the image above; for example, the results from user testing might encourage the design team to conduct another brainstorming session (ideation) or to go straight back to the drawing board and develop new prototypes. In essence, the Design Thinking process is iterative, flexible and focussed on collaboration between designers and users, with an emphasis on bringing ideas to life to see how real users think, feel and behave, as a way of empathising with those who will ultimately use these products in the real world to inform the overall design process.